Why don't Compass allow for faster speeds? Forums › Compass Communications › Why don't Compass allow for faster speeds? Ok dude, seriously, this is almost amounting to spam. Ask the provider. How many threads do you intend to start covering the (Basically) same material over and over. Time to take some responsibility for your own requirements and do some reading and research. Because they are sick of spammy threads about speed. networkn: Ok dude, seriously, this is almost amounting to spam. Ask the provider. How many threads do you intend to start covering the (Basically) same material over and over. Time to take some responsibility for your own requirements and do some reading and research. Excuse me, what?! I'm asking about Wimax and why certain speeds aren't available. Frankly if you can't offer any advice on why Compass doesn't offer faster speeds(equipment upgrades or otherwise) why post? By the way, I am asking the provider. This is the compass forums after all. This is not the Compass Forums, this is the Compass forums on geekzone, which is community based. I would be surprised if anyone here knew such information and if they did, likely they are covered by NDA and unable to share it. If you want information about the supplier in question, your best bet is to CONTACT THEM DIRECTLY. BTW I offered the relevant help you needed in my first response, which was.... Contact the SUPPLIER. 3) Competition reasons such as another supplier might be coming along with the same technology soon. 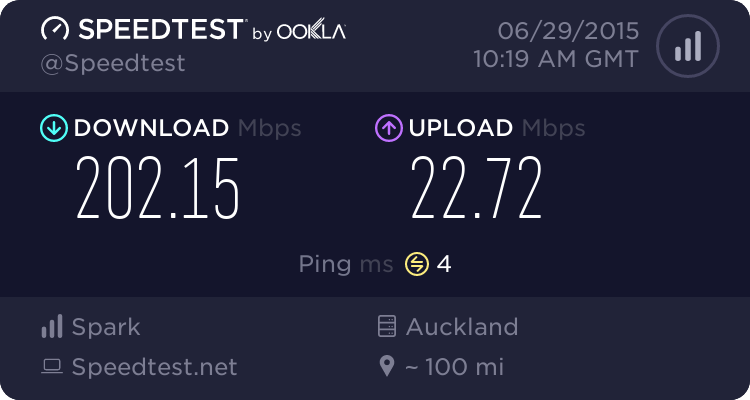 If compass offered this speed it would only be available to you. One person. The same reason 2g/3G/4g never gives max speed for long. Because WiMAX isn't capable of anywhere near 1Gbps. While WiMAX can provide those sort of speeds, it depends on the amount of frequency that they lease from the governement. The article talks about spectral efficency and that is defined in terms of bits/hertz. So the more frequency you rent, the faster the service you can offer (ignoring oversubscription considerations). However, Compass will also need to divide up the leased frequency so that there are no overlaps otherwise the receiving antenna won't know which base station is talking to it. So a tower may have 60 degree antennas allows the same frequency to be used twice (e.g. on the antenna facing north and the one facing south) - but that means you have to divide the leased frequency up into 3 sub-bands to avoid the overlap. Once that is done you need to co-ordinate those three frequencies with the towers next to it and avoid frequency clashes. So you get smaller and smaller bands to operate in. The 3.5 GHz frequency was divided up into 3.5 Mhz or 7 Mhz chunks so you can work out what is the maximum possible speed however I don't know what frequency the Compass WiMAX is using so can't offer anything more definative. So yes the WiMAX technology could provide that speed if there was only one antenna using all the available frequency etc. Why doesn't my vacuum cleaner offer no loss of suction? wired: While WiMAX can provide those sort of speeds, it depends on the amount of frequency that they lease from the governement. The article talks about spectral efficency and that is defined in terms of bits/hertz. So the more frequency you rent, the faster the service you can offer (ignoring oversubscription considerations). However, Compass will also need to divide up the leased frequency so that there are no overlaps otherwise the receiving antenna won't know which base station is talking to it. So a tower may have 60 degree antennas allows the same frequency to be used twice (e.g. on the antenna facing north and the one facing south) - but that means you have to divide the leased frequency up into 3 sub-bands to avoid the overlap. Once that is done you need to co-ordinate those three frequencies with the towers next to it and avoid frequency clashes. So you get smaller and smaller bands to operate in. The 3.5 GHz frequency was divided up into 3.5 Mhz or 7 Mhz chunks so you can work out what is the maximum possible speed however I don't know what frequency the Compass WiMAX is using so can't offer anything more definative. So yes the WiMAX technology could provide that speed if there was only one antenna using all the available frequency etc. "it depends on the amount of frequency that they lease from the governement"
"So the more frequency you rent, the faster the service you can offer"
Accept that 10/3 from Compass is good enough stop asking for more cause you won't get more. Every option has been offered and suggested but you continue to keep going wanting more. Gratitude goes a long way. It's a given in New Zealand broadband. muppet: Why doesn't my vacuum cleaner offer no loss of suction? Yeah 10/3 is pretty good Im not wanting more. I was simply curious. I mean it. I was actually curious about how it works. Why doesn't my local taxi company use lamborghini's? I've read about lamborghini's and that they go much faster than the nissan sunnies that my local cheap taxi company uses, I just don't understand why they are denying me this clearly superiour technology?? Then you will understand a few of the reasons as to why we are unable to offer faster than a 10/3Mbps offering. If you have any further questions regarding this, please do not hesitate to get in touch. P.S. Thanks to all users who contributed to this post.